Williams have confirmed Felipe Massa and Valtteri Bottas as their driver line-up for the 2015 Formula 1 season. Massa was already under contract for next term, whilst Williams have taken up the option on Bottas' contract following a superb campaign. For Brazil's Massa, 33, next year will be 14th season in F1. His Finnish team-mate, 25, has been rewarded for a season which has seen him finish on the podium four times. Williams are fourth in the constructors' championship after 12 races after finishing ninth last year, and both drivers said the team could make a further step forward in 2015. Deputy team principal Claire Williams described the line-up as "one of the strongest driver line-ups in Formula 1" and said retaining them was "an easy choice". Team principal Sir Frank Williams praised the talents of both drivers, highlighting Massa's 11 wins in eight years with Ferrari, where he partnered Fernando Alonso for four years from 2010-14 and Bottas' emergence as one of the rising stars of the sport. "Felipe is a very experienced driver," he said. "He has learnt how to stand up to Ferdy, my hero in Formula 1 and given him a hard time in the past and I have the highest regard for him. "It's relatively easy to move a team up from ninth to fourth, but when you're up there it is much harder to make the next step." "He's agreed to stay and we look forward to a new stronger season with him next year. "Valtteri is a long-term investment since we picked him up in his very early days and we have great hopes for him, too." Massa said: "Williams is like a family. I really enjoy working with these guys and I think we can make the team stronger. "We can do a fantastic second half of the season fighting with the top teams and that will be good preparation for next year." Bottas said: "Williams gave me the opportunity to get to F1. We have made a big step from last year and I see the team's future as a really good one." 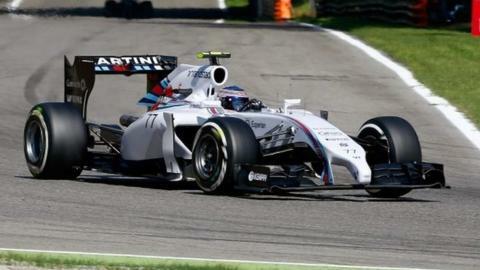 Claire Williams added: "We want stability. We just wanted to get the questions answered and keep our focus on next year. "For us, it's all about winning another world championship. "It's relatively easy to move a team up from ninth to fourth, but when you're up there it is much harder to make the next step. Now it is about what are the pieces we need to put in place in order to challenge for the world championship."